According to a recent CNN study, demand for pet accessories and services is rapidly increasing. The report notes that animals are becoming "more humanized and demand grows for new ways to spoil them." Now pet owners worried about the health of their animals can utilize an innovative $10 pet-health monitor, Petnostics, which is a screening kit for dogs and cats. The product consists of colorimetric chemical test strips that change color when they come into contact with the pet's urine. The strips' results are then displayed on a free app using a smartphone camera. This application allows users to screen for potential illnesses such as a urinary tract infection, diabetes or kidney stones. It also has the ability to determine whether a pet is dehydrated. Eventually, the company plans to apply the technology to humans. "Beyond the pet market, our technology is applicable to other areas such as human testing, water testing, and dairy testing, and these other markets are definitely on our roadmap," said Petnostics founder Stephen Chen. Kevin O'Leary, dubbed "Mr. Wonderful" on ABC's Shark Tank, and "QVC Queen" Lori Greiner both invested $300,000 in the product, for a combined equity of 20%. 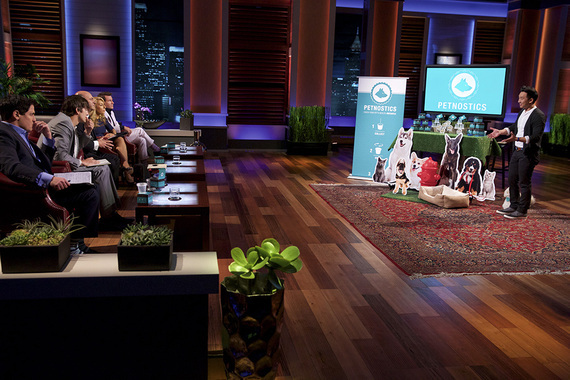 Less than a week after the product aired on Shark Tank, Chen noted that the response had been overwhelmingly positive on all fronts. "Sales have definitely spiked and people are talking about Petnostics all over social media. We're excited to see where we are in the next couple of months," he said. Chen says a lot of work went into making his success a reality. He had pitched to VC's and other investors before. "Not only do you need to understand your business and market inside and out, but you also need to know how to condense an enormous amount of information and deliver it in an impactful way that allows your audience to share in your vision," he noted. "That said, nothing can really prepare you for the entirely unique experience of Shark Tank. As soon as you step on set, everything you've been preparing for flies out the window. In that moment, it comes down to remaining focused and not letting the nervous excitement get in the way of the opportunity. Of course, that's easier said than done." Prior to Petnostics, Chen spent five years managing a medical device company. One of the projects he worked on was developing a new urine analyzer. "It was during this project that I came up with the initial technology that enabled mobile phones to replicate the functionality and accuracy of the traditional analyzer," he said. After developing the technology and coming up with the idea for Petnostics, it took a few months to develop working prototypes, created with 3D printing and rapid prototyping technology. "The overall process was extremely iterative and a series of trial and error," Chen said. "We had to develop very specific algorithms to ensure that our tests were accurate." Although this product isn't designed to completely replace veterinarians, it can save pet owners a lot of money if they suspect their pet has an ailment. Petnostics is also in talks with a number of vets regarding potential partnership opportunities. "From the very beginning, we have been in close discussions with the veterinarian community to make sure that the products we develop and bring to market are accurate, safe and effective," Chen said. After all, the information gathered by the product could potentially help veterinarians analyze an animal's health.